Well that's your lot. You can read Steve Marshall's wonderfully-crafted report if you fancy it. Ipswich never looked troubled by Charlton and move level with sixth-placed Birmingham before Saturday's 15:00 GMT kick-offs. But this performance will worry Addicks fans. On this evidence, it could be a long, hard season for them in the Championship. You can follow the rest of today's football via this link, but for me it's goodbye. 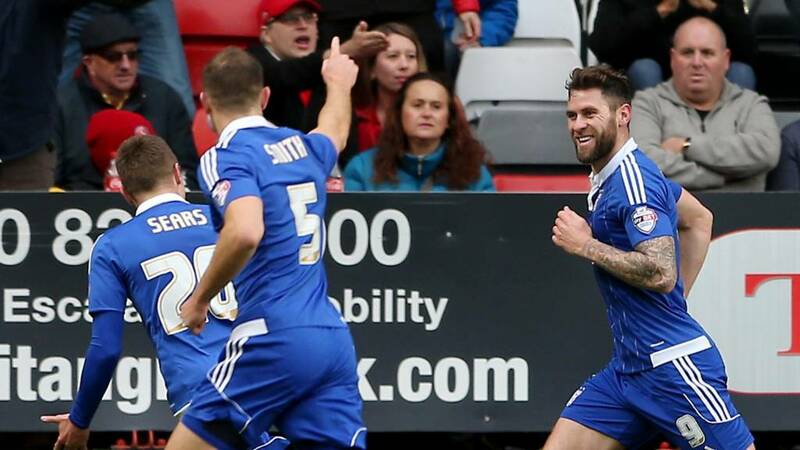 Ipswich striker and man of the match Daryl Murphy told Sky Sports. "We think we're heading in the right direction. The last few results we've had have been quite good. We just need to keep winning games and hopefully continue the way we're playing." "It's been a while since I scored. I'm buzzing to get the goal but the most important thing was three points and another good win. "We sewed it up in the first half and although they put some pressure on us at the start of the second half, once we got the third it was game over." Quote Message: Ipswich have been superb and thoroughly deserve the win. Charlton started this match with an air of confidence and they never gave up. It will be interesting to see what they do in their next game. They are a capable side but they are just short of goals. Ipswich have been superb and thoroughly deserve the win. Charlton started this match with an air of confidence and they never gave up. It will be interesting to see what they do in their next game. They are a capable side but they are just short of goals. That match will have given Charlton interim manager Karel Fraeye a headache. The Belgian had hoped the Addicks were back on track with two straight victories against promotion contenders, but today's defeat is a blow to that momentum. That was a textbook away performance by Ipswich today: tight at the back and taking their chances when they got them. Two goals from Daryl Murphy takes him to six from his last three matches, while Freddie Sears ended a run of 11 without scoring. Reza Ghoochannejhad has a glorious chance to head one back for the hosts, but nods wide of the mark from Chris Solly's pin-point cross. I'd love to be able to bring you some dramatic late action, but I can't - Johann Berg Gudmundsson's cross into the area easily dealt with by Ipswich defender Christophe Berra. Mick McCarthy runs down the clock a little more, bringing off goalscorer Freddie Sears for Australian Tommy Oar for a cameo appearances at The Valley. We also have four minutes of injury time to be played. This game appears to be frittering to an end now. Ipswich have offered much. Charlton very little. Ricardo Vaz Te has looked very dangerous since coming on for Charlton, but his powerful volley is once more kept out by the alert Dean Gerken - desperate to get a clean sheet. Ipswich winger Ainsley Maitland-Niles has not been that involved today, but gets a warm round of applause from the travelling fans as he comes off for Giles Coke. Conor Hourihane had the final say at Oakwell as his injury-time goal earned Barnsley a 1-1 draw with Sheffield United. Chris Basham had given the Blades a half-time lead. I say that, but Dean Gerken makes a marvelous save to deny Ricardo Vaz Te moments later when the Charlton forward heads powerfully towards goal and the Ipswich keeper palms it away with his left hand. Finally Charlton get a set-piece into a dangerous area, but Dean Gerken is equal to Patrick Bauer's header in front of goal - the first time the Ipswich keeper has really been tested today. Brett Pitman is the latest Ipswich player to have a crack at goal - being given space almost the size of Kent outside the box and volleying straight at Stephen Henderson. It is all too easy for Ipswich to get chances in this match. Great footwork from Ricardo Vaz Te sets up Ademola Lookman, but the Charlton youngster can't get the ball out of his feet and Ipswich clear the danger. That sums up the Addicks' afternoon. Not long left in South Yorkshire where Sheffield United still lead Barnsley 1-0. It looks like it's not going to be Barnsley's day as Lewin Nyatanga has now headed against the bar. Not really a surprise but Charlton bring off striker Simon Makienok - on a yellow card and anonymous for most of the match - for Reza Ghoochannejhad. Quote Message: It was a terrific move. There was a terrific dummy in a central position and it was worked to the left to Daryl Murphy, who dispatched it into the net. The boy is on fire. It was a terrific move. There was a terrific dummy in a central position and it was worked to the left to Daryl Murphy, who dispatched it into the net. The boy is on fire. It could have got even worse for Charlton, but Ipswich defender Christophe Berra can old head over from a set-piece. Charlton have got to hold themselves together. If Ipswich's first goal was scrappy, their third was a thing of sheer beauty. Town play their way through Charlton and midfielder Jonathan Douglas flicks through to Daryl Murphy, who passes home past his Republic of Ireland team-mate Stephen Henderson. Surely this is now game, set and match. And as I say that - Tareiq Holmes-Dennis hangs the ball up in the area, but Ipswich keeper Dean Gerken continues his afternoon of catching practice and gathers easily. Sheffield United still lead 1-0 at Barnsley thanks to Chris Basham's first-half header. The Tykes are continuing to push, though, with Sam Winnall seeing a header come back off the post. Into the last 10 minutes at Oakwell. As Ipswich midfielder Cole Skuse receives treatment for a bloodied nose, Charlton will think on the fact they have to find better quality to their danger men to cancel out Daryl Muprhy's opener and Freddie Sears' deflected strike. Christophe Berra has done a proper job on Charlton's big Danish striker Simon Makienok all afternoon - and the Addicks striker is the first to go into the referee's book this afternoon for tangling with the defender in the air. Bit of nothing, mind. Charlton look on top at the moment but just can't seem to find any quality delivery. Johann Berg Gudmundsson's corner - after great work from Ademola Lookman - is headed away by Ipswich and once more the Addicks defenders trudge back to their own half. Charlton midfielder Johann Berg Gudmundsson has a great chance to swing in a free-kick from the left after Cole Skuse's foul on Chris Solly. But the Iceland international's delivery is easily dealt with by Ipswich. A familiar pattern is developing. Simon Makienok has struggled to get involved so far, but leaves his mark on Christophe Berra, who early accidentally tread on the Charlton striker's hand. Berra and Makienok come together, leaving the Scot needing treatment. The cynic in me says it may just be a tactic for him to slow the game down as the Addicks look in the ascendancy. It's end-to-end stuff now as Charlton forward Ricardo Vaz Te has a dig at goal, but the sting in his strike is taken out by an onrushing defender and Dean Gerken can hold comfortably. Goodness me did Daryl Murphy connect with this one. The Ipswich striker plays a neat one-two and absolutely wellies the ball towards goal, but it creeps just wide from outside the area. That could have broken the net. A lovely one-two allows Chris Solly space to cross into the area, but Dean Gerken catches under a great deal of pressure. That was better from the hosts. At the other end, Ipswich winger Freddie Sears finds space on the right, but his cross into the area is easily dealt with by keeper Stephen Henderson. He has certainly been the more busy of the two keepers today. Ricardo Vaz Te is immediately involved in the action, but his cross is too long for Simon Makienok - who it has to be said has barely looked interested today. Back at The Valley Ipswich get us back under way. We've also had a substitution at half-time, with Charlton interim boss Karel Fraeye replacing full-back Morgan Fox with forward Ricardo Vaz Te. Positive move. Barnsley have wasted a big chance to level at Oakwell. Neill Collins brought down fellow former Wolves man Adam Hammill in the box but Sheffield United keeper George Long has turned away Conor Hourihane's penalty. Still 1-0 to the Blades. Will the visitors press home their advantage and go four unbeaten, or can Charlton continue their upsurge under Karel Fraeye? Remember, you can get involved using #bbcfootball on Twitter. We don't bite. Quote Message: Ipswich deserve their lead, no question. Their performance has been very professional. Charlton started very well but they didn't get any reward and they didn't create any chances. Ipswich slowly took control of the game and have got themselves in front. Ipswich deserve their lead, no question. Their performance has been very professional. Charlton started very well but they didn't get any reward and they didn't create any chances. Ipswich slowly took control of the game and have got themselves in front. Quote Message: It was a fabulous finish, it really was. It was sharp and accurate and it was past the goalkeeper in a flash. It was a fabulous finish, it really was. It was sharp and accurate and it was past the goalkeeper in a flash. It hasn't been the greatest of halves, but Ipswich have shown all the qualities of a true Mick McCarthy team - solid at the back and clinical up front. Daryl Murphy and Freddie Sears are the men to have Town in front at the break against a Charlton side who have offered very little other than a few sparks from Ademola Lookman. Charlton try to grab something at the end of the half, but a scramble in the Ipswich box comes to nothing, with no attacking player able to get a shot away. Ipswich have doubled their advantage and Freddie Sears, without a goal in his last 11 matches, is the man to get it. Ipswich's Ainsley Maitland-Niles is a name I haven't mentioned today, but the on-loan Arsenal youngster almost slips through Freddie Sears, but the ball is took long for the West Ham youth product and goes out for a goal kick. I think both sides just want the half-time whistle. Charlton fans will be frustrated with their side's poor quality in the final third as Johann Berg Gudmundsson's cross is easily headed clear by Jonathan Douglas, before a poor pass out wide gifts Ipswich the ball back. Charlton have the chance to put pressure on Ipswich with successive corners, but Ademola Lookman's second delivery is easily grabbed under the crossbar by Dean Gerken under no pressure whatsoever. At the other end, Charlton midfielder Jordan Cousins can't get enough power on Morgan Fox's cross and is easy for Dean Gerken to hold on to. The game is beginning to spark into life now. Maybe the shots of caffeine before the match are kicking in? Daryl Murphy is a man to be feared at this level. The Ipswich striker flicks on to Brett Pitman and gets the ball back on the right-hand side, but his left-foot cross is just too high for the onrushing and in-form Jonathan Douglas. Quote Message: Sheer pressure has caused that goal. The ball was bobbling around in the area and loads of players have touched that before Murphy put it in. Sheer pressure has caused that goal. The ball was bobbling around in the area and loads of players have touched that before Murphy put it in. Makienok is back on the pitch and is immediately involved, but Ipswich crowd him out as he looks to get a shot away on the edge of the area. After that goal, Charlton striker Simon Makienok, currently on loan from Palermo, is getting treatment after his hand was stood on by Christophe Berra. There was no intent from the Scotland international, but the big striker looks in a lot of pain. This goal wouldn't look out of place in a Sunday League match, but Ipswich won't care. Daryl Murphy has his fifth goal in three club matches as he finishes off a round of head tennis in the Charlton area, coming after Freddie Sears was denied brilliantly by keeper Stephen Henderson. Charlton may feel aggrieved by a hand off by Tommy Smith on an Addicks defender as he headed on to Murphy, though. Charlton youngster Ademola Lookman has impressed so far this afternoon and he cuts inside from the left, easing past Luke Chambers, but his scuffs his shot and it creeps wide of the post. OUCH! That one is going to hurt. Tareiq Holmes-Dennis lines up a shot on the edge of the area, but absolutely blasts it at team-mate Johann Berg Gudmundsson from five yards away - right into the unmentionables. Ipswich get the ball back, but the ref decides to stop play and give Gudmundsson the chance to get his breath back. Charlton look dangerous on the break and after Brett Pitman loses the ball on the edge of the Addicks' area, the hosts counter with pace. But a low cross from Johann Berg Gudmundsson (his name's a nightmare for live text commentators) is cut out by Tommy Smith and Ipswich survive. Quote Message: That was a lovely shot from Freddie Sears. He's come in off the left side and hit it with the inside of his right foot. It was great skill and on target. That was a lovely shot from Freddie Sears. He's come in off the left side and hit it with the inside of his right foot. It was great skill and on target. Great technique from Freddie Sears almost has Ipswich in front, as he manages to run on to Luke Chambers' cross, which looped wildly in the air off a defender, and hits the cleanest of volleys. But Stephen Henderson is equal to it and keeps the match goalless. Time almost seemed to stand still in the Charlton area for a second as no one seemed to react to Brett Pitman's flick. Eventually Pitman retreives the ball but Morgan Fox cuts it out for a corner which comes to nothing for the visitors. It's been a little bit scrappy so far. Charlton will probably have to go a little bit more defensive with the loss of Johnnie Jackson, who had scored in both of the Addicks' recent victories. Not great for Charlton as they lose their captain Johnnie Jackson, who signed a new contract with the club yesterday, to an early injury. He looks close to tears as he comes off for Chris Solly. It has the look of a long-term injury. Brett Pitman has Ipswich's first shot at goal from outside of the area, but it's tame and barely stings the palms of Stephen Henderson in the home net. But, almost immediately, Daryl Murphy heads just wide from Jonathan Douglas's cross. It looked rather easy for the Republic of Ireland man to get his header away there. We have the opening goal of the afternoon in League One where Chris Basham has headed Sheffield United in front against Barnsley. Interestingly, teenager Ademola Lookman is only making his fourth senior appearance, having joined the Addicks from Waterloo FC last year. He has looked the most likely to make something so far with his pace on the shoulders of Ipswich's back four. Ademola Lookman has looked very dangerous in these opening stages. He gets space out on the right-hand side, but cannot find Simon Makienok with his delivery. First sight of goal goes the way of Charlton as youngster Ademola Lookman turns an Ipswich defender, but his shot from outside the area is deflected out for a corner, which leads to nothing. Meanwhile, Charlton fans hold up signs in protest of their owner Roland Duchatelet showing their discontent at how the club is being run. The Addicks are immediately on the front foot, and use the left-hand side of Morgan Fox, but his cross is stopped by Luke Chambers. Charlton get us under way. We also have an early kick-off in League One this afternoon, with Barnsley hosting Sheffield United in a South Yorkshire derby. It's currently goalless at Oakwell. The teams are out at The Valley on a crispy autumn afternoon. We are moments away from kick-off in Saturday's early Championship match. So can last season's play-off semi-finalists Ipswich maintain their push for the top six? Or will the Addicks continue their upsurge in form under Karel Fraeye? And, more importantly, are you able name those two Premier League cult classics (12:15)? Let us know your thoughts using #bbcfootball on Twitter. Just one change for Ipswich from the side that drew at home to Wolves last weekend, with Ainsley Maitland-Niles replacing the injured Kevin Bru. Subs: Bialkowski, Malarczyk, Parr, Robinson, Coke, Tabb, Oar. The teams are in, and we'll start with the hosts. Charlton are unchanged from the side that won at Birmingham City last weekend. Subs:Pope, Lennon, Solly, Ba, Ghoochannejhad, Vaz Te, Ahearne-Grant. Mick McCarthy's Ipswich are also getting back to their best after a tricky spell of one win in 10 Championship games between the end of August and October. The league's early leaders have picked up seven points from a possible nine, partly down to the revitalised form of last season's Championship top-scorer Daryl Murphy, who has scored four goals in his last two club matches. The 32-year-old's hat-trick against Rotherham on 7 November ended his drought for the season, and he followed it up last week with another goal against Wolves. Charlton are enjoying a mini-revival of sorts under interim manager Karel Fraeye. The Belgian lost his first two matches after taking over from Guy Luzon - a man who had felt defeat in seven of his last nine games in charge. But impressive victories over promotion hopefuls Sheffield Wednesday and Birmingham City have lifted the Addicks out of the Championship relegation zone. Cast you mind way back to New Year's Day 2002. It may bring back painful memories for those who celebrated the night before a little too hard, or it could have been the start of the best year of your life. Well for Charlton and Ipswich it was the last time they faced each other in the top flight. Much has changed since then, with Town going down that year yet to return and the Addicks doing the same in 2007, but today they face each other in our early Championship kick-off.